Pictured is the Springfield Branch U.S. 23 Bridge (pedestrian only) with Ohio Wesleyan University’s Selby Stadium visible in the background. In the proposed City of Delaware’s 2019-2023 Capital Improvement Plan, funds are budgeted to plan for the rehabilitation of the two deteriorating concrete piers within the footprint of U.S. Route 23 and to repair the two piers possibly in 2020. The City of Delaware’s 2019-2023 Capital Improvement Plan (CIP) has been proposed and is currently being discussed among members of City Council. At Monday’s meeting, the ordinance to adopt the CIP was read for the third time. Adoption of the plan is expected to be done at the Oct. 8 meeting. A summary of the capital improvement general fund shows expected funds available for capital improvements after including revenues and subtracting the city’s debts to be $2,317,104 in 2019, $1,296,221 in 2020, $1,125,877 in 2021, $1,315,056 in 2022 and $1,740,544 in 2023. Expenditures by the city for capital improvement, according to the CIP, are projected to total $2,717,538 in 2019, $1,977,128 in 2020, $1,721,490 in 2021, $1,801,110 in 2022 and $2,349,207 in 2023. Expenditure categories include airport, street and park improvements, as well as equipment replacement, technology improvements, and building and sidewalk maintenance. Under the plan, $3,466,120 would be spent on street improvements over the five years, with $3,250,000 being spent on equipment replacement such as replacing one fire truck in each year of the plan, at a cost of $170,000 per truck, and replacing various maintenance and repair machinery. It is anticipated construction would begin in spring of 2019 and would only take one construction season to complete. Another project included in the CIP is the repairing of the Springfield Branch pedestrian bridge that extends over U.S. Route 23, the Olentangy River and River Street. 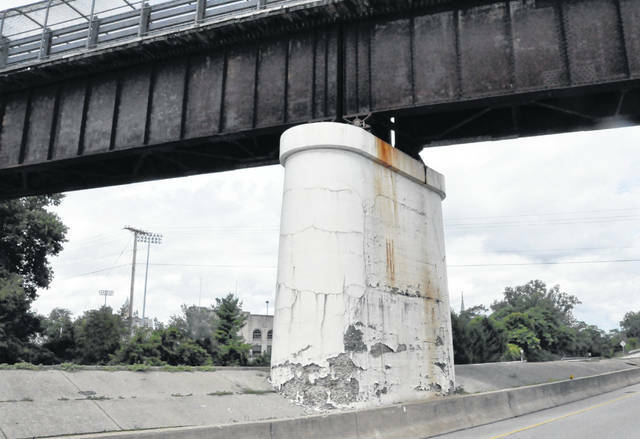 The two cement piers on U.S. 23 are deteriorating and repairs are needed to prevent further deterioration and concrete from the bridge falling onto U.S. 23. The report estimates the repairs would cost around $150,000, but notes a more accurate estimate would be available early next year. The city is also weighing the cost-effectiveness of the repairs against replacing the entire bridge with a new structure that would be similar to the pedestrian bridge that was constructed in Orange Township. The full report, which will be finalized ahead of the Oct. 8 meeting, can be read by accessing the agenda for the Sept. 10 city council meeting, which can be found on the city council page under the departments and services tab on the city’s website.